EU ambassador to Israel hints: Even if Trump recognizes Jerusalem as Israel's capital, we won't follow suit. The European Union's (EU) ambassador to Israel, Emanuele Giaufret, hinted on Monday in response to a query from Arutz Sheva that even if U.S. President Trump recognizes Jerusalem as the capital of Israel, the European Union does not intend to follow suit. "The connection between the Jews and Jerusalem cannot be denied. There is no one who can deny this connection. Having said that, our embassy is in Tel Aviv, like all the other countries’ embassies, and it will probably remain there. We do not think that a significant step on the issue of Jerusalem right now will help the diplomatic process," said Giaufret. "There is a UN resolution on the issue - and the question of Jerusalem should come up in negotiations between Israel and the Palestinians. It would not be good for us to take a new position, before the negotiations. Jerusalem is a sensitive issue that is important to all religions - and it is important that we make an effort so that each side understands the sensitivities of the other side," he continued. The ambassador’s comments came amid reports that U.S. President Donald Trump may declare that the U.S. recognizes Jerusalem as Israel’s capital and that such recognition could come as soon as Wednesday. Giaufret, who spoke with journalists, also discussed the Israel-Palestinian Authority peace process, saying that the United States is the one that sets the tone for negotiations. "The EU believes in the two-state solution. This is the only solution and in our opinion most Israelis agree to this solution. There is constant communication with the U.S. on this issue. If the U.S. makes a good offer for peace, we will support it. We do not need or want to be the leaders," he said. The ambassador also answered the question of how the EU views Israel and President Trump's desire to see changes in the nuclear agreement signed with Iran. "We are better off with the nuclear agreement with Iran than without it. It is an agreement that is not based on trust, but it has shown results and is good for everyone's interests. There are other issues with Iran besides the nuclear issue, such as the Iranian presence in Syria. We have an angle of our own on this issue, and we must talk about it - but regardless of the agreement with the superpowers." Giaufret was asked about claims of illegal construction by the EU in Area C and claimed that "there are about 100,000 Palestinians in Area C. We are building structures solely for humanitarian needs that the EU funds through non-profit organizations that meet the humanitarian needs of Palestinians who are usually very weak and poor. These are not homes, but buildings on a humanitarian basis for needy populations." He refuted claims that the EU is one-sided, saying, "The human rights of the Jews and of Israel are very important to the EU. We may not communicate well on this issue, but it does not contradict the fact that it is important to us. Israel is perceived as strong and many value it, while the Palestinians are perceived as weak." Giaufret stressed that the EU opposes anti-Israel blacklists. "The blacklist is a decision of the UN Human Rights Council. When the subject came up, we declared that in our opinion there is nothing in this process that we can support." 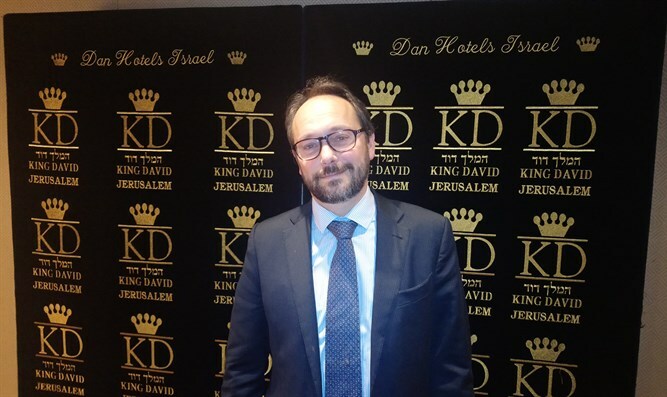 As for the anti-Israel movements in Europe, the ambassador said, "We do not support BDS and we are certain that delegitimization of Israel will not help either side. There are countries that have already passed laws against it. We make sure not to invest in bodies that support or identify in any way with the BDS movement." At the same time, said Giaufret, organizations like Peace Now are legitimate in his opinion. "It is important that every country have non-profit organizations that have a say on various issues."